Art Tirrell brings a rare gift to lovers of historical fiction: an engrossing, epic story that resonates with the current times as much as it does with the past. The Wind from Entouhonoron is part adventure, part romance, and entirely moving. Set during the War of 1812, readers are given a historical book marker as their way of relating to the characters and their tale, knowing that the time of the novel is set during a period of great change, unease, and moves toward a wide future for America. Jake Eastland, abandoned by his father as a young boy and raised by the Widow Vincent on Lake Ontario, is surprised and less than happy when his errant father returns after fourteen years. Telling Jake, “The land at Little Salmon was ours, until they wrote a paper and took it away”, Jake’s father attempts to persuade his son to search for sunken gold on the Ontare. Reluctant to believe his father, but running out of options as people fight to claim the recently deceased Widow Vincent’s land for themselves, Jake must figure out if these are simply more drunken ramblings from a man who left his son behind, or if there really is a way to save the land he has grown up on. It is not only Jake’s future at stake; many others love and depend on the land. Without the gold, there may be no way to preserve it from the greedy and the wicked vultures who seek to claim it. A sweeping tale that provides no limit of adventure, The Wind from Entouhonoron is vivid and rich, allowing the reader to sink into the depths of the characters and the changing world around them. Tirrell’s masterful storytelling and knowledge of the land he writes about lend themselves to this saga that is not to be missed by lovers of historical fiction. Art Tirrell is the author of The Vitamin Effect and The Secret Ever Keeps. He is an entrepreneur and avid sailor, being the proud owner of “formerly owned things that float”. He is also the owner LakeOntarioObserver.com, where he reports on events of interest to boaters, as well as being co-owner of a retail store in Oswego, New York, that is now in it’s 38th year. The Wind from Entouhonoron is his third novel, and a fourth is completed, it’s highly anticipated release projected for 2013. In a world that growing increasingly negative and destructive, sometimes a return to the ways in which we are giving beings by nature can start us on a path towards a more fruitful and happier existence. Author Karl Allen explores this concept in his book, The Golden Virtues of Jesus Christ. Designed for readers who are looking to improve their quality of life and their relationships both to and with others, The Golden Virtues of Jesus Christ is written so that readers can identify which virtues they may be lacking and redesign their lives so that they are enhancing, rather than diminishing, those positive qualities. With negative examples of how to live our lives surrounding us every day, it can become difficult to remember that at our core, we are beings meant to improve the lives of those around us, as well as our own. Allen explores virtues such as kindness, honesty, gentleness, courtesy, thoughtfulness, fairness, and justness in his book, examining each for both its meaning and the ways that applying them to daily life can strengthen bonds between people and improve relationships. Ideal for readers who are on a journey of self-improvement that includes their inner life as well as their outer life, The Golden Virtues of Jesus Christ provides valuable insight into the things we have in each of us that the world needs to see in order to become a beautiful place for all who live in it. Karl Allen is a senior Psychology major with minors in Sociology and Philosophy. In addition, he is also an un-ordained minister who has read the Bible from cover to cover, and is eager to help others improve their lives through its teachings. Author Joanne Lewis’ The Lantern: A Renaissance Mystery chronicles the story of two girls, one from modern-day Miami and another from 15th century Florence, which spans two continents and five hundred years. The story takes readers on a whirlwind journey across time and space. Along the way, they are joined by some familiar figures, including members of the Medici, Michelangelo, Brunelleschi and Donatello. In Miami, Filippa George is released from prison and faces a choice: should she return to her abusive boyfriend or should she pursue her grandfather’s dream and go to Florence to find the girl who dared to compete to build the lantern on top of Brunelleschi’s dome? Personal setbacks make it difficult for her to travel to Florence. However, it soon becomes clear to her that it is more important than ever that she pursues her grandfather’s dream and that she do it quickly. The novel’s other heroine, Dolce, is the mysterious fifteenth century girl who Filippa seeks. Despite many obstacles, Dolce is determined to become an architect like Brunelleschi and enters the contest to design the lantern on top of Brunelleschi’s dome. This compelling novel has already received notable praise. The New York Times best-selling author of Brunelleschi’s Dome, Ross King, calls The Lantern a “delightful and imaginative fable of hope, redemption, and rebirth” and the author of The Feud that Sparked the Renaissance, Paul Robert Walker, calls The Lantern an “entertaining, provocative tale of dreams pursued, told with humanity and passion.” The Lantern won first place at the Royal Palm Literary Awards in the category of historical fiction. Readers will, undoubtedly, find the story of Dolce and Filippa compelling. Joanne Lewis is an attorney and author who lives in Fort Lauderdale, Florida. As a lawyer, she is a family mediator and guardian ad litem who represents the best interests of children. As a writer, she creates character driven novels and has a special interest in mysteries and historical fiction. When not working as an attorney, Joanne is writing. She is the co-author of the award winning novel Wicked Good, which tells the story of a boy with Asperger’s syndrome who searches for his birth parents. Joanne used her experience as a former prosecutor to bring Make Your Own Luck: a Remy Summer Woods Mystery to life. Find Joanne Lewis on Twitter at https://twitter.com/joannetlewis. Find Joanne Lewis on Facebook at https://www.facebook.com/joannelewiswrites. 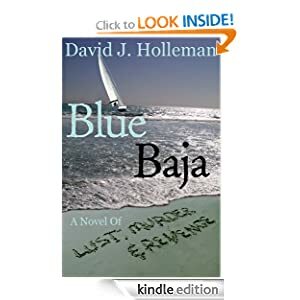 In Blue Baja, David J. Holleman reveals the lengths to which some people will go in their quests to reach the American Dream, putting ambition and a public façade of wealth and success before human life. Holleman artfully renders many ambitious characters who deal in organized crime, portraying the duplicitous nature of such successes through the character of JoJo, who bears a striking resemblance to many successful mob members, leading an outward life of material and social success, while the means that he used to attain it are deeply disturbing. JoJo’s All-American existence largely reflects the recently apprehended Boston mob boss, James “Whitey” Bulger, who was living under the pseudonym “Charlie” in Santa Monica for the last fifteen years with his long-time girlfriend. His neighbors were shocked by the revelation that he was the man responsible for so much violence, murder, and crime in Boston, as he was known as a “dog-lover” and envied for his peaceful and idyllic retirement. Bulger and JoJo’s stories are not unlike many who lead double lives within the mob, frequently known by their neighbors as nice, All-American families, more known for their prowess on the golf course than their sordid activities. Blue Baja addresses this phenomenon of ambition, the distorted American Dream, and what it means to be “All American,” leaving readers to wonder how well they really know their neighbors. Networking can mean the difference between success and failure; for most people, knowing how to network to their advantage is crucial. In his new book, Business Networking Simplified (for the Internet Age), author Les Garnas shares his valuable insight on how to utilize networking to your greatest advantage. Reaching out to others is the first step of networking, as Garnas points out. Familiarizing yourself with others in your industry and asking for help with contacts is the number one way to get your face, and your business, recognized. Using case studies and QR symbol shortcuts to the author’s views, this book highlights for readers the knowledge that will be the most beneficial to them in the long run: how to network. In the current economy, many individuals are “starting over”; gaining a new education, leaving an old workplace for a new one, or even starting their own business. Looking for ways to change and mold their futures, many people become stumped when their own efforts don’t get them to where they want to be. Using Garnas’ advice and maximizing their networking skills, readers will find new ways to help themselves, their businesses, and their futures thrive and flourish. Les Garnas has more than three decades worth of practical business experience, and is highly skilled in the art of helping others boost their self-esteem and motivation. He lends this experience to Business Networking Simplified, increasing the potency of the advice and guides throughout the book. A perfect read for anyone who is looking to increase their networking skills and use them to their highest advantage, Business Networking Simplified is not only an outline for business; it’s an outline for life. Les Garnas has used his 35 years of business experience to coach both the successful and the young and eager to new business heights. A strong believer in helping to build self-esteem in others, Garnas is highly skilled in the art of one-to-one motivation coaching. His other book, How to Use People to Get What You Want and Still be a Nice Guy!, also deals with utilizing networking skills to readers’ advantages. Les is passionate about helping people to understand and embrace the value of change, with an ever-constant focus on personal and professional growth and development. The average person is looking for results when it comes to their fitness. Seeing a change as soon as possible can help them to stay on track and continue with their fitness regimen. Unfortunately, most fitness plans don’t allow for the unique differences in each person’s body type, making a visible difference harder and harder to come by. All of that is about to change with 21: 2 Experts, 1 Goal (21 Days to Transform Your Body), the new guide to being truly healthy, from authors Daniel Loigerot and Elina Kaminsky. Gone are the days of the “one-size-fits-all” fitness routine: introducing readers to the many different body types, Loigerot and Kaminsky define the different needs of each type, helping readers truly tailor their fitness regimen to themselves. The book begins with a nutritional guide, helping readers to begin from the inside and work their way out, as healthy eating is the true cornerstone of any successful body improvement regimen. 21 will help those who are looking to improve their stamina, build their strength, lose weight, and prevent chronic diseases by walking them through an easy-to-apply solution that will work for them. Additionally, these routines are simple to follow, so much so that continued application even after 21 days is simple. Loigerot and Kaminsky instruct readers on how to exercise more effectively and eat more flavorfully, to improve their overall experience of the fitness regimen, helping them to see results faster, feel better about their bodies quicker, and stick to the plan for even more improved body tone and health. Perfect for readers who are looking to incorporate healthy eating into their fitness regimen, and for anyone searching for a way to successfully change their lifestyle, 21: 2 Experts, 1 Goal is an ideal fitness guide that is tailored to the individual needs of readers. Danile Loigerot has over two decades worth of experience to share with the fitness community. He has owned and managed fitness centers in both the U.S: and France. He has worked with many celebrities at DLFit, and his expertise and work have been featured in many prominent publications, including Self, TimeOut New York, InStyle, People and US Weekly. Additionally, he has appeared on multiple popular television programs to share his knowledge of fitness with America. He is currently working on the development of Daniel Loigerot Inc., which focuses on providing Health, Wellness, and Stress Management Programs through the DLFit Brand. Best-selling author Greg Messel gives readers the highly anticipated sequel to his previous novel, Last of the Seals, in this exciting and fast-paced mystery crime story, Deadly Plunge. Once again, readers will be drawn in to the mysterious world of private investigator Sam Slater as her races against time to find the answer to his biggest questions yet. When a rich widow walks into his office swearing that her wealthy, successful husband didn’t commit suicide, Sam decides to take her case, unaware that the leads he’s about to follow are going to lead him on a dark and twisted path that will put his life, and the life of his secret love, Amelia Ryan, in danger. Even though the dead man’s body was found floating in the deep waters of the bay and his car was parked on the Golden Gate Bridge, everyone who knew him swears he would never take the jump. Determined to get to the bottom of things, Sam and Amelia begin to uncover the hidden pieces of the dead man’s life. Among those pieces is a beautiful, old Victorian house; one even his widow did not know he owned. Once Sam and Amelia begin investigating the house, they are on a path to disaster, as the political intrigue begins to unfold and men who don’t want them to tell any tales are on their heels. Sam and Amelia must unearth the dead man’s secrets if they want to get out of this alive, and they’re running out of time. A brilliant novel that pulls readers into the glamorous world of 1958 San Francisco, Deadly Plunge is not only a sequel; it works perfectly as a stand-alone novel for first-time readers of Messel’s work. Sure to please those who read Last of the Seals and entice newcomers to Slater’s world to read more of his story, Deadly Plunge is a thrilling ride through mystery, murder, mayhem, and some well-kept political secrets. Greg Messel is the author of Expiation, The Illusion of Certainty: A Modern Romance, and Sunbreaks. As a young man, Messel was an award-winning columnist, garnering himself a Wyoming Press Association award for his work with the Daily Rocket-Miner newspaper. After a 27 year career with Pacificorp, Messel returned to his first love, writing, in 2008. For more information, please visit his website at http://expiationbook.wordpress.com/. Follow Greg Messel on Twitter @GregMessel. Find Greg Messel on Facebook at https://www.facebook.com/greg.messel. Deadly Plunge is the second release in Greg Messel’s Sam Slater Mystery Adventure Trilogy, a unique, genre-spanning series that is filled with everyone from baseball players to mobsters to socialites to TWA flight attendants. The Sam Slater Mystery Adventure Trilogy is centered on protagonist Sam Slater, a minor league baseball player turned private eye. Author Mary Metcalfe once again gives readers a glimpse into the human condition and the ways that our choices can affect our lives with her newest novel New Beginnings. It’s a moving story about starting over in a place where the past can’t be avoided and the future is uncertain; New Beginnings is a phenomenal read for all lovers of the Women’s Fiction/Contemporary Romance genres. Carol Brock has had horrible luck with men. She kicked her first husband to the curb after he took up with a woman half his age. After that heartbreak, she got into a string of destructive relationships with unsuitable men, including a con artist and art thief, who managed to tarnish her professional reputation and put a strain on her relationships with her college-age children. Throwing herself into her work as a real estate agent, Carol has sworn off men until she can reclaim her life. All of that changes, however, when Boston’s most eligible bachelor, Devin Elliott, puts in an offer on a beautiful Victorian home that Carol is showing. Unable to deny her attraction to him, Carol wonders where this potential romance may lead her. What she doesn’t expect is the psychopathic fury unleashed by an ex-girlfriend of Devin’s when his offer is put on the table. As she and Devin try to simultaneously stay one step ahead of his violent ex while attempting to get to know one another, Carol must determine whether or not she is willing to risk her heart yet again. Metcalfe’s ability to paint the human condition shines through yet again in New Beginnings, offering readers a story of a life that will keep them captivated until the very last page. Mary Metcalfe was a professional writer and editor for her entire career. It wasn’t until 2011 that she finally decided to tackle the challenge of writing a novel herself, and the result was her fantastic book, Winds of Change, which quickly garnered fans and lovers of the Women’s Fiction genre. New Beginnings is her second title, out in October of 2012, and her third novel, Road to Tomorrow, is due to follow in November 2012.